If you have not heard of "As A Man Thinketh" book, then you're missing out a powerful course that can literally change your thought process to achieve success in life. In fact, even the world's #1 success coach, Anthony Robbins had mentioned As A Man Thinketh in one of his courses. 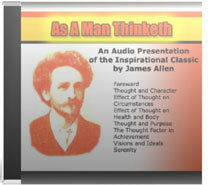 Instead of reading the book, I'm going to give to you a FREE As A Man Thinketh Audio Course CD with no string attached. Special Bonus When You Request For Your FREE CD Today! As the plant springs from, and could not be without, the seed, so every act of a man springs from the hidden seeds of thought, and could not have appeared without them. This applies equally to those acts called "spontaneous" and "unpremeditated" as to those which are deliberately executed. As his own shadow - sure.